My name is Alan Barasch. 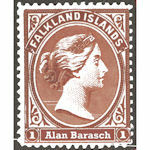 I have been collecting the stamps of the Falkland Islands since about 1969 and exhibiting them since 1977. 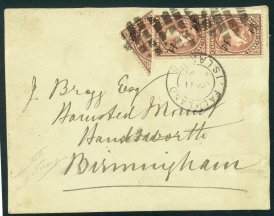 I am a life member of the American Philatelic Society, member of the Falkland Islands Philatelic Study Group, American Association of Philatelic Exhibitors, St. Helena, Tristan and Ascension Study Group, a life member of the Society of Israel Philatelists, American Topical Association, Royal Philatelic Society, London, and a number of local clubs. In my spare time, I write the websites for all the local stamp shows and clubs. I was a freshman in college (U of Tennessee, Knoxville) and I was telling a friend about my collection. At the time it was a total of 5 volumes; including Israel, a scattering of recent US, and some foreign. This friend looks at it in disgust and said, “real collectors specialize in something, they do not try to collect the world.” I pulled my catalog off the shelf and opened it at random. It fell open to Falkland Islands. Over 30 years later I am still at it. In 2012, I am redefining the exhibit even further. 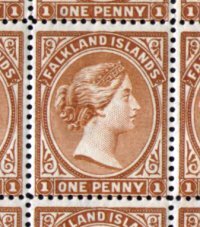 The new exhibit is should expand from one-frame of one penny stamps to 5 frames covering the entire QV period. I have accumulated enough material to fill 6 frames but would rather tell a tight story. Showing 8 different postion pieces of a cheap item is not productive. The Exhibit covers the years 1878 to 1902 or more appropriately, the issues of the Queen Victoria era. The Scott's catalog numbers these issues 1 through 21 with several varieties. Stanley Gibbon's numbers them from 1 to 42 with considerably more varieties. The Heijtz catalog, which I think is one of the most comprehensive, list numbers to 15 but goes into excruciating detail of the varieties in each value. There being about 18 color variations, these 2 kinds of bisects and constant varieties. Watch WSP shows for this exhibit. Here is a PDF of the presentation that I gave at Gladstone Philatelic Club in October 2015. It is over 8 megabytes. Need more information about the Falkland Islands?